Busy B Family: Walking in a Winter Wonderland!! Walking in a Winter Wonderland!! hope everyone had a wonderful Thanksgiving! We had a great one, ate WAY too much food and had an overall super time! We truly have so much to be thankful for year after year. Friday, Chris decorated the house!! WooHoo!! Nothing I love better than Christmas decorations! My house has been decorated for 2 weeks and now the outside is done! Anywho, it was a really lovely day and I'm desperately needing pictures for Christmas cards, so I thought I'd take the little mister out front and take some! 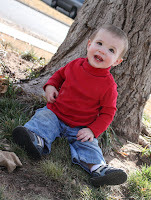 Out of over 100 pics, these are the only ones where he was, or almost was, looking at me. The rest were pretty much of his bottom as he crawled away from me. Think any of those would work? Saturday, Chris worked, so me and Landry just hung out. And then I babysat Landry's 2 month old girlfriend and her 5 year old brother.... Wow, 2 babies is hard work! :) All was well until it was time for Ella to have her bottle. Landry was FURIOUS! eesh, it was bad! But other than that, we had a fun evening! Sunday, we woke up to it SNOWING!! Anyone and everyone who knows me, knows I LOVE the snow! It was a wet one too! We were lazy bugs all day (Landry actually stayed in his pj's all day...) and thoroughly enjoyed sitting in front of the fire! Grammy had bought L a really awesome sled a few weeks ago and a snow suit, so I was dying to try it out! Does this picture not totally remind you the younger brother in his snow suit? Hehe, he kept rolling back and forth cause he couldn't roll over to get up! I know, I know, I'm horrible!! But it was funny! 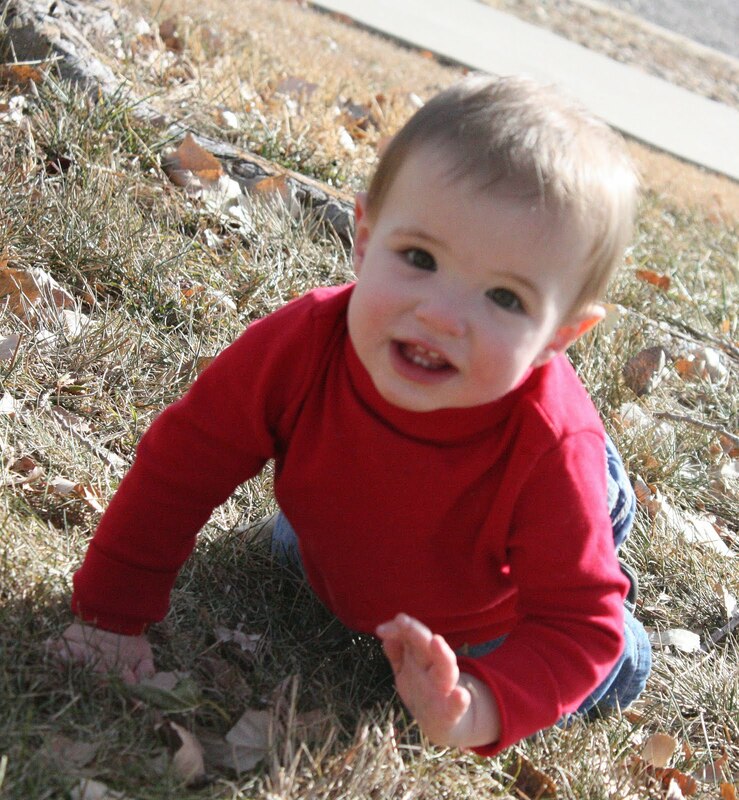 Landry and his daddy playing in the snow! He loved it! My hutch in the kitchen is one of Landry's favorite places to clean out. Yesterday he opened the bottom drawer and took out my beaded wreaths for the doors and crawled in there! PS. do you see the Jim Shore Santa's Workshop on the hutch??? It was my Christmas present!! 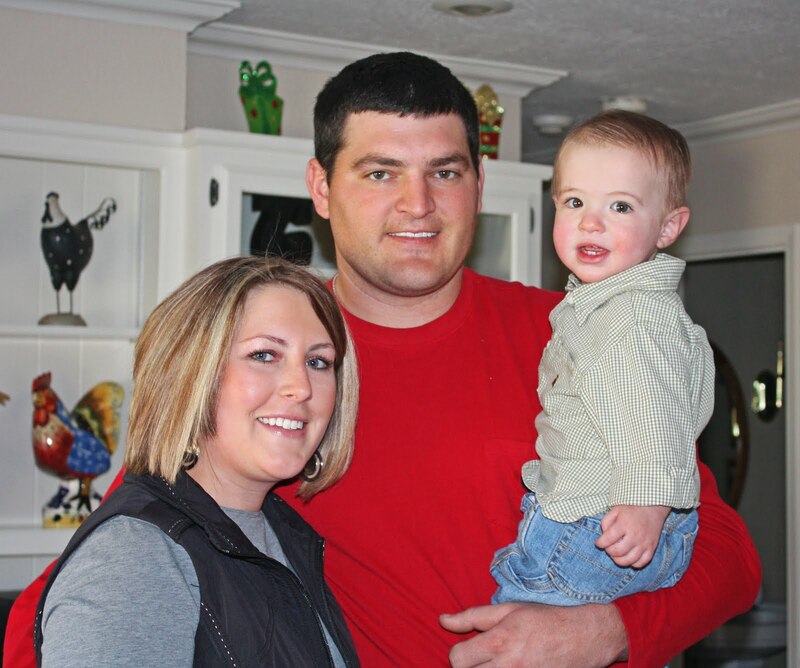 Yes, it was early, but Chris, Landry, and Addi wanted me to enjoy it this year!! But seeing as how I leave out almost all my Jim Shore year round, I probably will this one as well! 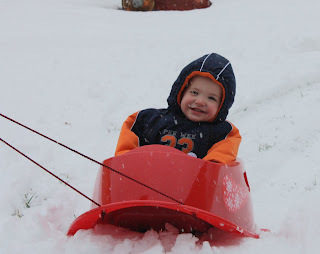 And here's a video of Landry enjoying playing in his first sled!! Hope y'all have a wonderful day!! 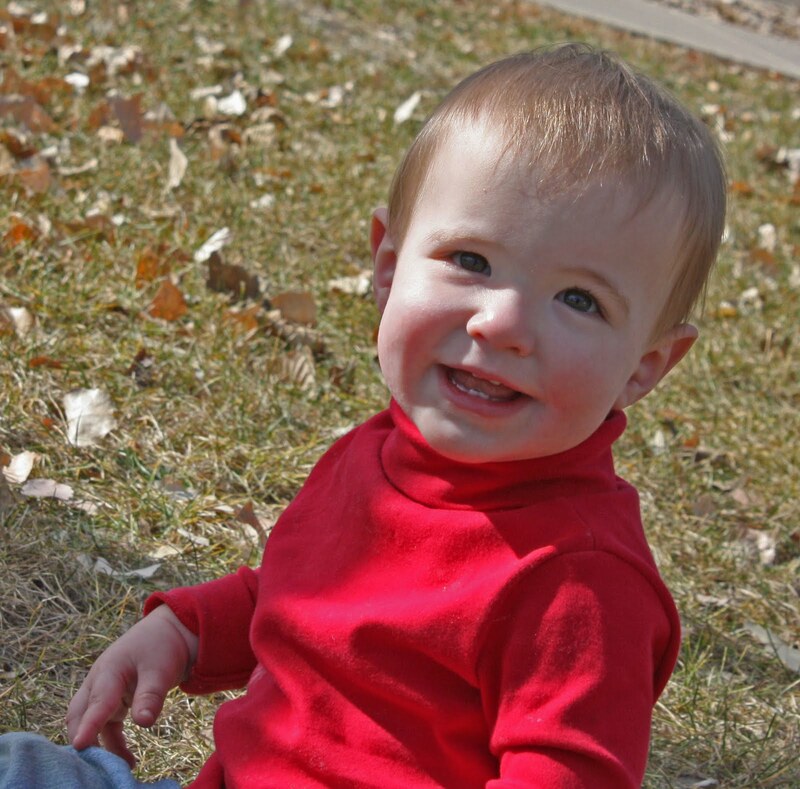 I love the picture of him laying on the floor in his snow suit, too cute! 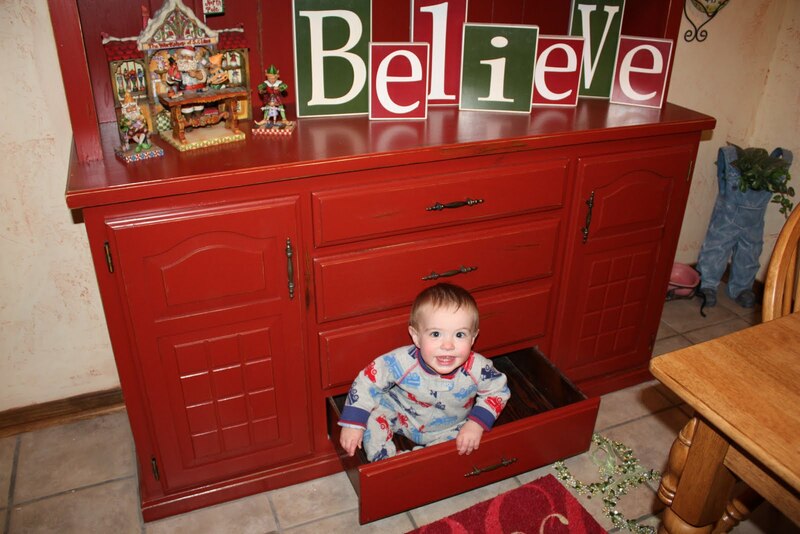 Landry is finding him a good place to watch for Santa. Thanksgiving was great being with family.What a super new sled to play in the fluffy snow. Your hutch is so cute! 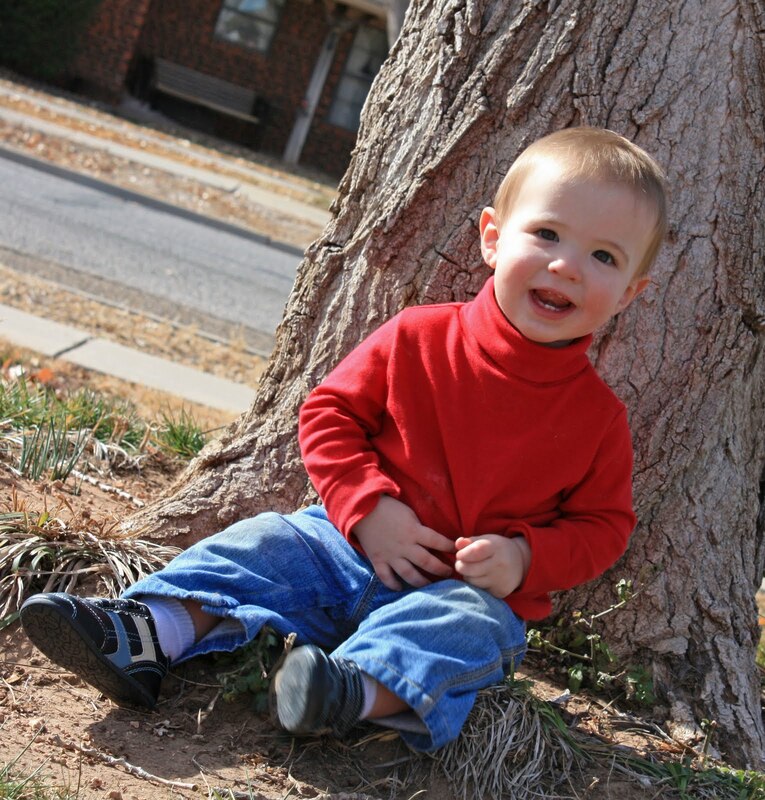 Landry is a doll, love the pics in his red turtle-neck! I love all of Landry's photos any one of them will be perfect for your card. As for the sledding I can't tell who was having more fun, Chris or Landry. I'll bet Chris' back was sore afterward.